Adults small, black, up to 1/8″ long. Single node on pedicel, very long legs, very long “scape” (first antenna segment). Small colonies nest commonly in structures, feeding mostly on insects as well as other structural debris. Very fast, erratic movements give it its name. Adults very small, light colored, up to 1/16″ long. Two nodes on pedicel, antennal club made up of 3 enlarged segments. Very large colonies, multiple queens, workers forage long distances from nest. 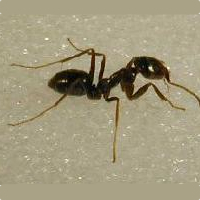 Infest most structures, feeds on various foods, of some human health importance. Control principaly by baiting. 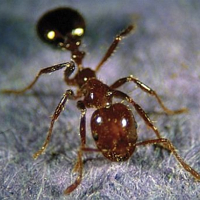 Adults yellowish to red and black, up to 1/4″ long. Two nodes, no spines on thorax, well developed stinger. Dirt mounds indicate nests in soil, rotten wood, under boards, concrete. These insects are wasps, not ants. 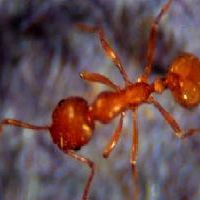 Females are wingless and covered with dense hair, superficially resembling ants. 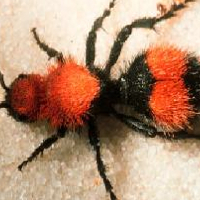 The red velvet-ant is the largest velvet-ant species, reaching about 3/4 inch in length. 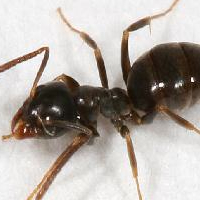 They are black overall with patches of dense orange-red hair on the thorax and abdomen. 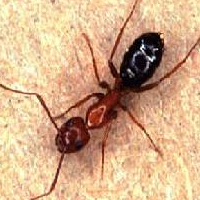 Males are similar but have wings and can not sting. Adults up to 1″ long. Colors vary from tan to reddish to black. Single-node on pedicel, thorax without spines and with an even, rounded profile dorsally. Commonly established satellite nests in structures connected to major nest in soil. Do not eat wood, but may create large cavities in wood for nests. Adults shiny black, Up to 1/8″ long. When crushed gives off strong odor of rotten coconut or rancid butter. Common in houses, with strong attraction to sweet substances. Adult with single node to pedicel, the node attached very close to abdomen. Adults red and black, very hairy. Up to 1/4″ long. Two nodes on pedicel. No spines on thorax. 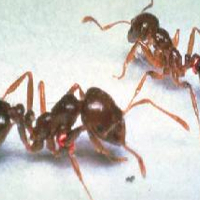 Nests in soil with up to 250,000 ants in a nest. Nests are dirt mounded up on surface Workers are fierce stingers, living up to 180 days.